2. Adipose Tissue ExtractionRemoval of adipose tissue is carried out under general anaesthetic and is performed either via removal of the inguinal fat pad or via liposuction. Once the adipose tissue-derived material is harvested (15 to 20 grams of fat), the joints requiring implantation are shaved and the dog is removed from general anaesthetic and receives further levels of opiate as required. The adipose tissue is processed using a procedure that takes less than one hour. The cell population contains a mixture of various cell types including adult mesenchymal stem cells and their derivatives. 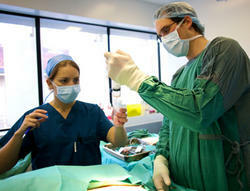 The patient is lightly re-anaesthetised and the joints are surgically prepared. Transplantation is performed via a standard injection for each joint. Joint fluid is aspirated to ensure correct placement before the cells are injected. Up to 12 joints have been treated in the one procedure. AdiCell Results During clinical trials, 33 dogs that received AdiCell treatment for arthritic joints were assessed prior to, and after treatment. The assessment involved a veterinary assessment prior to treatment, an assessment at 10 days and monthly intervals for 6 months. The examination involved scoring for lameness, range of motion, functional disability, pain on manipulation, proprioception, swelling and ability to climb stairs and to jump. Within 10 days of being treated with AdiCell, some arthritic dogs showed a significant and in certain cases, a dramatic improvement in mobility. At the six-month point, results showed all dogs that suffered from osteoarthritis and joint pain, improved after the AdiCell treatment. All 33 dogs showed improvement in mobility in their arthritic joints. The improvements ranged from 53% better mobility, which represents the worst result, to 100% improvement. Average mobility improvement is 84%. An independent survey with dog owners confirmed these results. Dog owners' total satisfaction rate was 97%, three months after AdiCell. 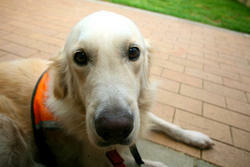 Results show 100% of dog owners consider the severity of their dogs' arthritis had decreased after AdiCell. There are a number of possibilities as to why AdiCell produces such dramatic improvements, including the molecules produced by the transplanted stem cells leading to anti-inflammatory effects, and the local environment being stimulated to generate new cartilage via the transplanted cell population and/or the resident cells of the synovial sac (thin tissue that lines the joint). Recent molecular breakthroughs in permanent cell labelling technologies now allow for the unambiguous tracking of cells. When adult mesenchymal stem cells are transplanted into damaged joints, the cells are observed to embed into the surrounding tissue and to generate new cartilage (Murphy, Fink et al. 2003), (Wakitani, Goto et al. 1994). Beyond the risks of anaesthesia, fat harvest site bruising and irritation, as well as the minimal risk of infection in the harvest or implantation site, the AdiCell procedure is well tolerated by animals. 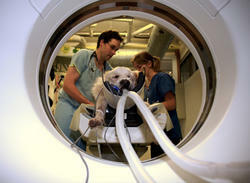 Most dog owners are generally surprised at the degree of recovery the day after the procedure. If a surgical fat pad excision is required, the harvest wound is usually bruised and in some cases swollen. However, this rarely creates problems for the dog. Of the 90 cases treated to date, only three dogs have shown no signs of improvement and no dogs have had their condition worsened by the procedure. 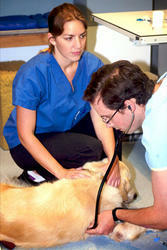 AdiCell is only currently available at Ku-Ring-Gai Veterinary Hospital in North Turramurra, Sydney. The procedure will be available nationally in the coming months.